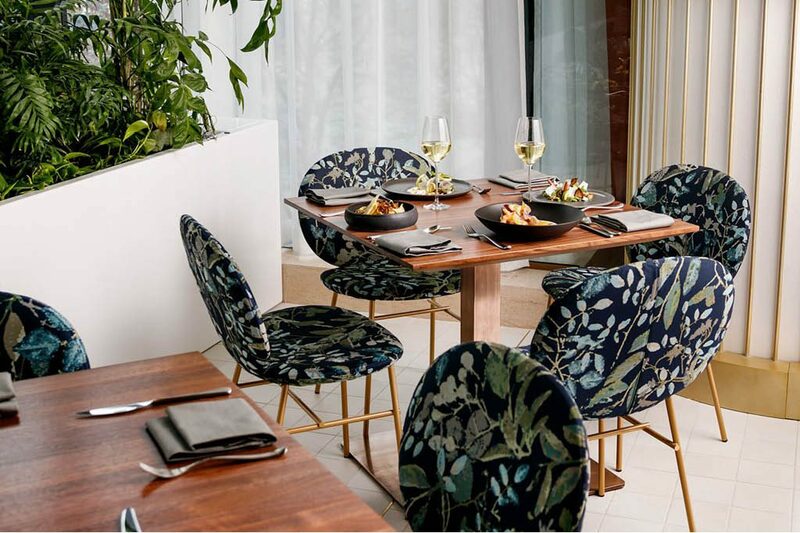 Vancouver, British Columbia, has just welcomed Botanist, the new highly anticipated restaurant designed by Ste. Marie Designin collaboration with Glasfurd & Walker. Located inside the Fairmont Pacific Rim hotel, the restaurant is determined to offer something to suit every patron’s desire, boasting four, beautifully executed spaces inside its doors – a Champagne Lounge, Cocktail Bar and Lab, a Garden and Dining Room – serving the culinary creations of Executive Chef, Hector Laguna, and wine director, Jill Spoor’s accompanying selections. The Champagne Lounge on the hotel’s second floor, overlooking the lobby, welcomes patrons with its glass walls and soothing color scheme featuring pink champagne-colored seating that comfortably surrounds white-topped tables. Pale wood floors and abundant touches of flora play off each other, infusing the space with a touch of nature’s ease. Meanwhile, a deeper color palette infuses the Cocktail Bar and Lab – think dark, Italian Terrazzo and sculptural glass elements – creating an intimate experience for patrons looking to sample the sophisticated cocktails, exclusively created by Grant Sceney and David Wolowidnyk, many of which also play an innovative homage to the botanical inspiration of their surroundings. The Dining Room, the final space, offers a décor that is a culmination of the rest. Featuring the same flora touched upholstery, this time in a deep rust color, natural materials also take center stage; such as the pale gray leather sheathing on a number of chairs and the same light-colored wood floors which run through the whole of the restaurant. However, the main design attraction of this space is undoubtedly the large, curving “S” banquette that flows through the heart of the room. Covered in a pale pink champagne-colored leather, the banquette both separates and connects guests as they sit around its curving design.